"This album is taking steps," Nick Jonas told Billboard.com during a teleconference with reporters on Wednesday. "We're trying to learn as much as we can, continuing to grow." Kevin Jonas added that "the overall message is its the same old Jonas Brothers, in a sense" but said the group would be "adding more and more music," including horns and strings and "different musical instruments that are going to add and build to the sound we already have." Nick said the songs on the new album -- whose title the brothers are not yet revealing -- are "our journal in songs," mostly about "all things we've gone through, personal experiences we get inspiration from." But citing the continuing influence of Elvis Costello, he added that "we've also been working on trying to use metaphors...to kind of mask a literal thing that happens to us." Other inspirations the trio cited for the new album include the Zutons and Kings of Leon, as well as Neil Diamond, who the Jonases saw perform when they took part in the MusicCares Person of the Year tribute during Grammy Awards week last month in Los Angeles. Nick said the group has already record nine songs with "a few more to go." John Fields is again producing the album, which was recorded concurrently with the filming of the trio's new "J.O.N.A.S." action/adventure/comedy series, which is due to debut in May on the Disney Channel. Several songs from the album will be featured in the show as well. The Jonases are also gearing up for their first world tour, which begins June 20. The show will be performed in the round on a 144-foot-wide stage that incorporates a large circular water screen. "We've developed a new way to (use) this," Kevin said of the screen. "It will ad a very intersting effect...It will feel like you're in a whiole other world when you come in the arena and see the stage." "We wanted to find a way to provide a bigger and better show to our fans," Joe Jonas said. "The entire bottom half of the arena and the upper desk is esentially a front-row ticket." 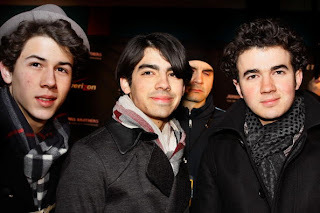 He added that the group hasn't decided yet whether to film the show for a DVD or a feature-film follow-up to their current "Jonas Brothers: The 3D Concert Experience."